According to Antigonish Registered Respiratory Therapist (RRT) Dawn Oliver, that group likely includes many Canadians who – for various health reasons – depend on portable oxygen or CPAP therapy. Dawn has been a RRT with Family 1st Medical Antigonish since 2008 and has helped countless people adapt to life with home or portable oxygen supplies. She says some people assume that once they begin relying on oxygen, travelling just won’t be worth the effort. She is quick – and happy – to assure them that isn’t the case. She has a number of travel tips, with the first beginning before you even leave the house. First thing, make sure you take your CPAP unit with you. Some people don’t want the hassle of dragging another bag when travelling. I encourage clients to think about how they were feeling before they started CPAP therapy. Nobody wants to feel tired, cranky, and worn out when they’re on vacation. 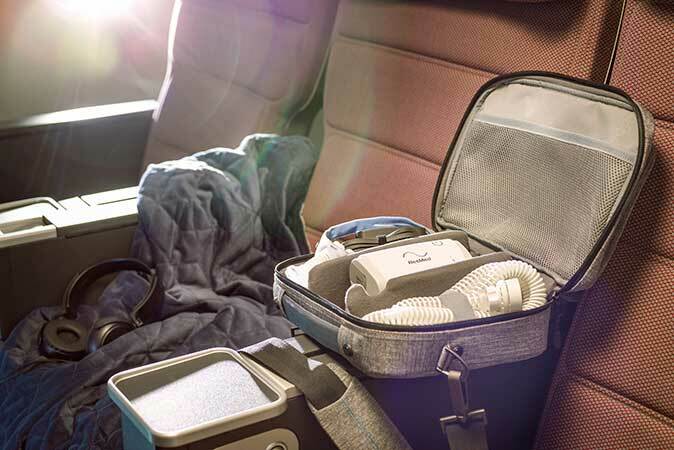 And if a regular unit is too big or cumbersome, we have small CPAP units made specifically for travelling. The next step, she says, is to do your homework. Check ahead to see if you will require power adaptors for your CPAP units. All newer machines that Family 1st sells and rents have universal power supplies that can adapt to various voltages when travelling on international trips. An extension cord is also a good idea, since power outlets near your bed may be used by lamps or alarm clocks. She also encourages her clients to think about supplies. For example, you’ll want to confirm that distilled water is available at your destination. If you’re unsure, Dawn says most airlines and countries allow you to transport water in an unopened container in your luggage (but always check in advance to be sure). If your trip is going to be lengthy, you might want to invest in an extra mask, or at least an extra silicone pillow, in case your luggage is damaged or stolen. Finally there’s the all-important (and ever frustrating) matter of airport security. Because your CPAP unit is a medical device, it doesn’t count as part of your carry-on luggage. But be ready: airport security will likely ask you to open the bag for them to inspect it. I also advise you to carry your prescription as well as the manual for the CPAP unit and humidifier. Whether you’re travelling or not, Dawn wants everyone to know she’s here to serve. I’ve lived in Antigonish my whole life and I became an RRT to make a difference in peoples’ lives. I think anyone who comes to see me will discover how deeply I care about my clients, and how much I love getting to know them. To reach Dawn or any of the Family 1stMedical team at an office or clinic near you, call 1-800-565-2021 or call Dawn directly dial (902) 863-8178.